There are a couple of ways to sign-in to your Zoom Rooms. The account owner or any admin on the Zoom account can sign-in to the Zoom Room with their own credentials and choose which room to login into. You can also create a role in Role Management to use the Zoom Rooms work email login or allow specific account members to login to the Zoom Room. If you do not want to provide the person setting up the Zoom Room login credentials for your account, you can have them setup the Zoom Room with an Activation Code. This code is generated after setting up the Zoom Room on the web portal and will be emailed to the user who created the room and also be viewable in the web portal. The Activation Code is active for 10 days, after which a new Activation Code will need to be generated. Using the Activation Code is ideal when the person deploying Zoom Rooms is not the administrator. Open the Zoom Rooms application on the computer. 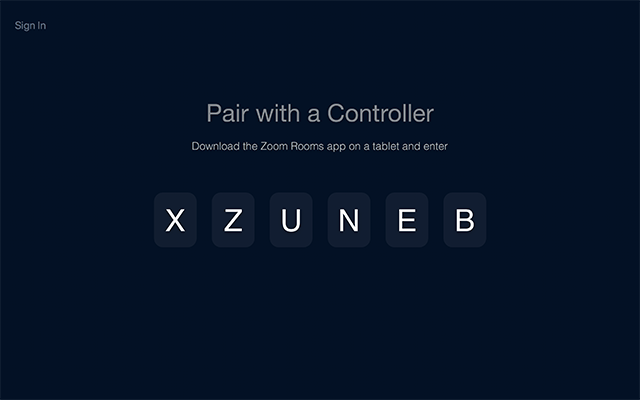 Open the Zoom Rooms app on the Zoom Rooms Controller tablet. The computer will display a pairing code. Enter this code on the controller. On the Zoom Rooms Controller, tap Sign In. Sign in as the account owner, an admin, or a user with the Zoom Rooms role. Tap the name of this Zoom Room. Learn how to add a new room from the controller. The computer and controller will now be signed in. After configuring the Zoom Room on the web, open the Zoom Rooms application on the computer. On the Zoom Rooms Controller, tap Enter Activation Code. Enter the Activation Code, found on your web portal or emailed to you. Login to zoom.us and go to your Role Management, under User Management. Enter a Role Name, such as Zoom Room. Check View for Zoom Rooms. You now have the new role created for Zoom Room access, but you will also need to edit any Zoom Room users to give them this permission. Go to Users under User Management. Locate the Zoom Room email address. Click Edit on the right. From the Role Dropdown, select the Role Name that you created in Step 3 above. You will now be able to login to the Zoom Room with the Zoom Room work email address or as any admin or owner.